2019 cars - time to go electric or stick with petrol or diesel? Nissan Ireland is scathing about this country's electric car charging network. With many of us now deciding on new cars for 2019, our Motoring Editor, Donal Byrne, looks at the pros and cons of staying with diesel or petrol or making to the change to electric or hybrid. The question many prospective new car buyers are increasingly asking is whether they should make the break from petrol or diesel now ? The answer is probably yes if you are thinking of a hybrid car - but a great deal more caution is required if you are thinking of going electric. Right now we don’t have the required infrastructure to make electric driving the pleasure it should be or the peace of mind it should afford. It has many fans for several reasons - chief among them their green credentials and low running costs - but the early adapters (forgive the pun) have been let down by the lack of infrastructure needed to reduce range anxiety. We have 1200 charging points around the country, but only 17 are fast-chargers. 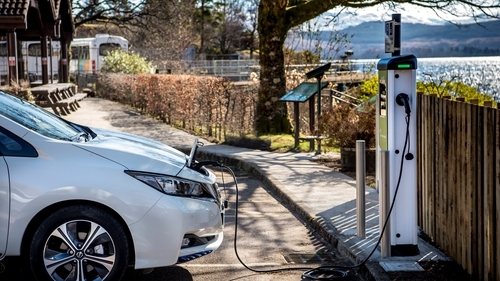 The ESB is promising more outlets after it begins charging for electric car charging next Spring but, so far, there is no figure on the number of charging outlets that will be provided. While the ESB says the average time to charge a car back up to 80 per cent of its power is 25 minutes, many electric car drivers will attest to the difficulties they face on a journey, especially a long one. Non electric drivers hogging charging bays, cars left at them for much longer than the charging time required or charging units that are out of order are all issues EV drivers have had to contend with. These problems do no reassure people concerned with "range anxiety", who are fearful of simply running out of power on a motorway or country road. Home charging, if well planned, is a major advantage but no one wants to think of being stuck with no option. It’s not like you can make your way to the local filling station to pick up a can of fuel. Nissan boss in Ireland, James Mc Carthy, is scathing of our electric car charging infrastructure. The CEO of Nissan Ireland, James Mc Carthy, whose company sells the most popular electric car - the Nissan Leaf - is scathing about this country's preparedness for an electric future. "The Government plan is to have 200,000 electric cars on the road by 2020. It will be a miracle if we hit 20,000. There is a complete lack of coordination between stakeholders and there are different agendas. The charging infrastructure plan has withered on the vine. There is no buy-in from local authorities and forecourts have not kept up with the demand either. For example, I don't see Dublin City Council making any commitment", he told me at the Electronomous conference earlier this year. The ESB announced during the week that it would begin charging for electricity at public outlets from next Spring but gave no indication of how much the cost would be. It is also looking at expanding charging points to enable between two and eight cars to charge but an awful lot of work needs to be done before people are comfortable setting out on a journey in the knowledge that they will never be too far from a charging point if they need it. Given that the Government wants 800,000 electric cars on the roads in Ireland within the next twelve years, the challenge is a very big one indeed. However, electric cars are improving fast. I drove the latest Nissan Leaf a few months ago and got a range of over 180 kilometres and had just under 20 per cent left in the battery. That drive pushed the Leaf as I wanted to see how flexible the car could be. For most people on average commutes (the average in urban areas is about 8 kilometres, or 16 a day both ways) the Leaf’s range is very acceptable, especially if you can then charge overnight at home and keep the battery topped up. However, there are exaggerations when it comes to range capacity claims by car companies and it is also worth remembering that an EV will use up far more energy in winter than in summer because in winter heaters, demisters, lights and radios are all in heavier use. At the moment, it costs around €1,000 Euro to install a home charger but you get a €600 Euro grant from the Sustainable Energy Authority. Most EV drivers are shrewd planners because they need to be. So far only some 5,000 Irish drivers have bought EVs. Apart from cost, there are major infrastructural issues to be addressed before many people who would like to go electric can do so. These are the points to consider before committing to electric. Hybrid cars like the Toyota Yaris are a good -mediumterm option because they use both electricity and petrol, but don't need to be plugged in to charge. Hybrid cars are a good option right now because they also have an engine and don't need to be recharged - but it’s important to remember they are not the long-term solution. The Government will not incentivise them as they do electric cars because they still partially rely on petrol or diesel, neither of which are acceptable in the future. The fact that they were excluded from the free toll road scheme for electric cars proves the point. However, if you want to make a "green" contribution and use much less fuel then a hybrid is a good option but you will eventually have to make the switch over to electricity. Some experts say they are the best medium-term option. The Government says they have no place in the future and by 2040 all cars in Ireland will be electric. They are more economical and the battery they run on does generate much cleaner energy than the petrol engines with which they are mated. So how long will that take and what of diesel and petrol choices right now? Both have a way to run yet. Millions of people in Europe drive diesel and petrol cars and they can’t be put off the road overnight. But they will be increasingly persuaded and forced to in the next five years or so. This week I wrote about the German diesel scrappage scheme that manufacturers all over Europe are embracing. Grants to up to €8,000 Euros are being given to owners of older diesel cars to get them to drive a cleaner diesel or one of the many, many electric cars that all manufacturers are now racing to produce. Pretty much everything depends on Government policy in the coming years but I can't see petrol or diesel cars being put off the road for several years. There will be more incentives for electric cars and a greater push away from petrol and diesel but without that infrastructural development - and it will need to be massive and therefore costly - we are going nowhere fast and certainly not as far as some would claim or like. Another thing to bear in mind is the fact that the State takes about €2 billion a year in revenues from diesel and petrol and that revenue will be maintained. And it's only going to come from one place in the future - your electricity bill.